Description: Sexes similar. 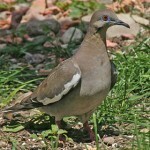 Pale gray head and underparts; sandy brown mantle; dark primaries. 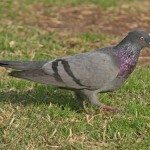 Thin black half-collar on hindneck bordered by white above and below. 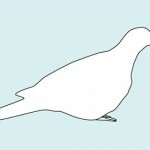 Tail is long and squared, as opposed to tapered in the Mourning Dove. Juvenile lacks neck collar and is sandier overall. Habitat: Occurs in its original range in semi-desert and arid country with scattered trees; tends to avoid cities. Elsewhere, the birds occur in towns, cities, parks, and gardens. Where in Nebraska: Accidental. First seen in Nebraska near Shelton, Buffalo County in 1997. First confirmed nesting was in Kearney in 1998. 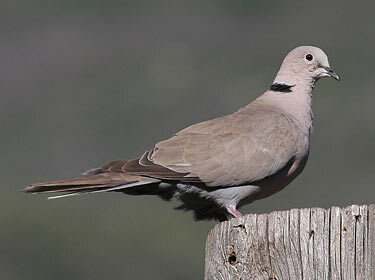 Fun Facts: Thought to originate in India, the Eurasian Collared Dove first entered the USA via Florida in the early 1980’s, and is now in nearly all the states.